With global increased rates of obesity, bariatric surgery is becoming more popular worldwide. Many types of research were conducted regarding its complications and management. An aortoesophageal fistula is a rare complication with a high mortality rate. We report a 34-year-old male patient, who underwent gastric sleeve surgery, complicated by leak 9-month postoperative managed by endoscopic self-expandable stent insertion. After 3 months, he developed an aortoesophageal fistula that was managed with endovascular stenting. In this report, we present our experience using endoscopic and endovascular stents as an approach to control aortoesophageal fistula. A 34-year-old military male patient, medically free with no previous surgeries, came to the clinic with a history of weight gain and multiple trials of weight reduction measures. The patient height was 163 cm and weight was 132 kg with a body mass index of 48.2. After having explained different surgical options, the patient opted for laparoscopic sleeve gastrectomy. The surgery was planned and done on October 15th, 2015. The patient was admitted at the clinic; all routine preoperative preparations were considered and they were all within the normal range. Nine-month postoperative, the patient presented with abdominal pain and vomiting. Investigated and computed tomography (CT) scan showed contrast leakage at the gastroesophageal junction. Upper gastrointestinal endoscopy and 24 mm × 180 mm fully covered esophageal stent was deployed across the duodenum, and jejunostomy tube was inserted. After 1 year and 2 months of the surgery, the patient presented to the Emergency Department with hemoptysis, hematochezia along with two episodes of syncope, and hemoglobin of 7.5. 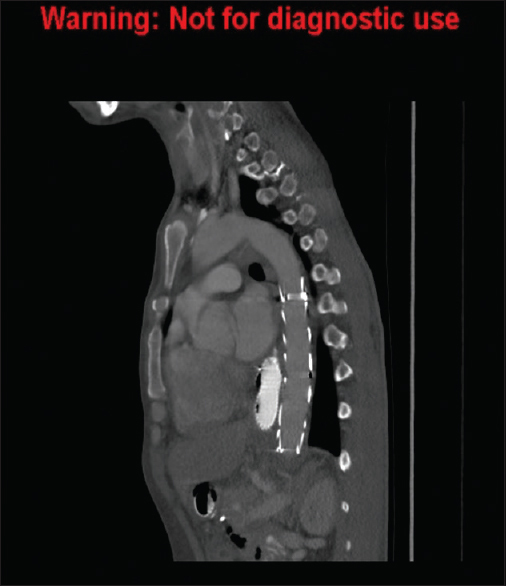 CT-Scan was done, showed large amount of intravenous contrast extravasations seen inside the esophagus and stomach, with linear fistula tract connecting the aorta and distal esophagus [Figure 1]. An aortic stent was inserted. 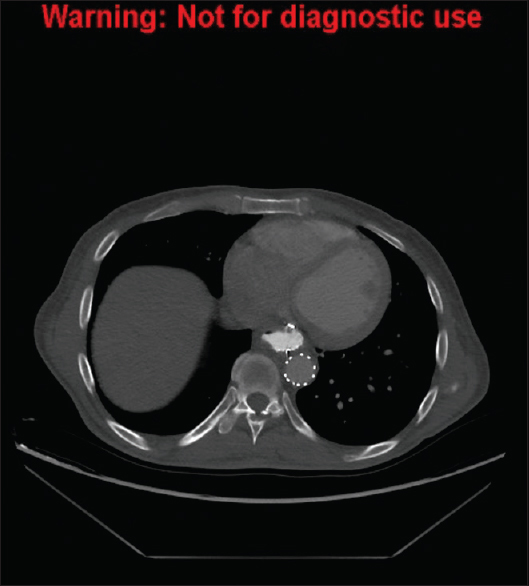 The patient was retained as an inpatient for 2 months, discharged on a stable condition, did CT 2 weeks after discharge that showed no evidence of a leak and gastric stent was removed [Figure 2]. After 2 years of follow-up, the patient was doing well tolerating orally and had no complaints. The World Health Organization has described obesity as one of the greatest current threats to human health. The rising prevalence of obesity is causing significant health burden concerning morbidity and mortality. Laparoscopic sleeve gastrectomy is becoming increasingly popular because of technical simplicity and low complication rate. Staple line leak is one of the serious complications, which has significant morbidity and mortality. As described in the literature, the most common site of a leak is the gastroesophageal junction with an incidence of 1.9%–2.4%. Self-expandable stent has been one of the most successful ways of treating staple line leak. Although stents have a very high rate of success in treating leak, they are not without serious complication. The most common complication is migration, persistent leak, and aortoesophageal fistula being a rare fatal complication. The aortoenteric fistula (AEF) is a rare and usually life-threatening condition. The mortality rate is high reaching up to 77% with intervention and is 100% fatal without treatment. AEF can be classified into primary and secondary in origin. The most frequent cause of primary AEF is a thoracic aortic aneurysm, which is engendered by such causes as the rupture of penetrating aortic ulcer, foreign-body swallowing, thoracic trauma, esophageal cancer, and bronchogenic carcinoma. AEF is usually difficult to diagnose and needs a very high index of suspicion. Surgical intervention to massive bleeding form AEF curries a high risk of mortality. The AEF is a relatively rare and usually life-threatening condition. Described for the first time by Dubrueil in 1818, primary AEF has been known to be very rare but a lethal clinical entity. He described Chiara's triad for diagnosis of the AEF which include: midthoracic pain, herald hemorrhage, and fatal hematemesis. On the review of the literature, most of the described cases occurred after aortic procedures and grafts. There is one case report published in the World Journal of Gastrointestinal Surgery, 2013, and it was the first aortoesophageal fistula case after stinting for sleeve gastrectomy leak. They reported 43-year old female who underwent a laparoscopic sleeve gastrectomy that was complicated by a proximal gastric pouch leak at the gastroesophageal junction. they used self-expandable stents (SEMS) in the management of the leak. Seven weeks after the insertion of the stent, the patient presented with a massive gastrointestinal bleed that could not be localized due to profuse bleeding. CT scan was done and could not localize the site of the bleed. An emergency laparotomy was performed and identified the source of bleeding to be an aortoesophageal fistula. A graft of the diseased area was attempted but the patient unfortunately did not survive the procedure. The other paper was written by Takahiro et al. They reported 27 patients with secondary aortoesophageal fistula secondary to aortic lesion; they concluded that stage surgery consisting of resection of an aneurysm and esophagus, in situ reconstructions of the descending aorta, and omental flap installation provided a better outcome in the treatment for AEF and bridging thoracic endovascular aortic repair to the open surgery is a useful adjunct in patients with AEF with hemorrhagic shock. Later reconstruction of the esophagus can be performed in the survivors. The last paper was published in the European Registry of the Aortic Repair Complications. They reported that 36 patients post aortic surgery had developed AEF. All patients were Followed for 90 days and the results showed that the first group which was treated conservatively had a mortality rate of 100% in 1st year, the Second group who were treated with esophageal stent had a 17% survival rate in 1st year, third group were treated with isolated esophagectomy had a 43% survival rate in 1st year and the last group treated with radical esophagectomy and extensive aortic reconstruction had a 46% survival rate in 1st year which was the best outcome. In our case, the plan was to take the patient later for resection and reconstruction, but on the follow-up, he was doing well, and his swallow studies showed no evidence of a leak; therefore, we decided to keep him on observation with regular clinic follow-up, and this was the patient preference too. This case demonstrates that although the success rate with the use of self-expandable metallic stent for the management of leak postsleeve gastrectomy is high, they still have potential complications and a high index of suspicion is required to pursue timely management of such complications. To the best of our knowledge, this is the second case that reports an aortoesophageal fistula as a result of a SEMS for the management of a gastric pouch leak after a laparoscopic sleeve gastrectomy. Chen X, Li J, Chen J, Zhou Y, Zhang Y, Ding H, et al. A combined minimally invasive approach for the treatment of aortoesophageal fistula caused by the ingestion of a chicken bone: Case report and literature review. Clinics (Sao Paulo) 2012;67:195-7. Yang Y, Hu D, Peng D. Primary aortoesophageal fistula: A fatal outcome. Am J Emerg Med 2018;36:343.e1-343. Aday U, Ali Çetin D, Çiyiltepe H, Gündeş E, Bozdağ E, Senger AS, et al. Cause of mortality in aortoesophageal fistula: Oesophageal sepsis. A case report. Prz Gastroenterol 2017;12:222-5. Marone EM, Coppi G, Kahlberg A, Tshomba Y, Chiesa R. Combined endovascular and surgical treatment of primary aortoesophageal fistula. Tex Heart Inst J 2010;37:722-4. Yamazato T, Nakamura T, Abe N, Yokawa K, Ikeno Y, Koda Y, et al. Surgical strategy for the treatment of aortoesophageal fistula. J Thorac Cardiovasc Surg 2018;155:32-40. Leenders BJ, Stronkhorst A, Smulders FJ, Nieuwenhuijzen GA, Gilissen LP. Removable and repositionable covered metal self-expandable stents for leaks after upper gastrointestinal surgery: Experiences in a tertiary referral hospital. Surg Endosc 2013;27:2751-9. Czerny M, Eggebrecht H, Sodeck G, Weigang E, Livi U, Verzini F, et al. New insights regarding the incidence, presentation and treatment options of aorto-oesophageal fistulation after thoracic endovascular aortic repair: The European registry of endovascular aortic repair complications. Eur J Cardiothorac Surg 2014;45:452-7. Almadi MA, Bamihriz F, Aljebreen AM. Fatal aortoesophageal fistula bleeding after stenting for a leak post sleeve gastrectomy. World J Gastrointest Surg 2013;5:337-40.